General assembly in the way the term is used in the occupy movement is usually asamblea popular, not general - though they are often just called 'asamblea'. Asamblea general is, however, used for the United Nations general assembly. 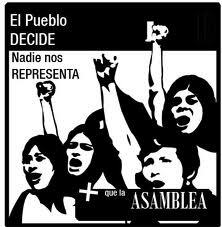 There is a long history of holding asambleas in many communities and movements across Latin America, often coming more out of indigenous traditions than anarchist ones.